Quaint and Quirky: Favorite Project Ever! It really has very little to do with me and everything to do with the fabric. I was hired to make an apron for a little girl. I thought of Heather Bailey's PopGarden immediately because of its whimsical and cheery color scheme. I want one of my own and I want to skip around in it! I liked it so much, I made another one, hoping someone else would like it too! It's now available in my etsy shop! 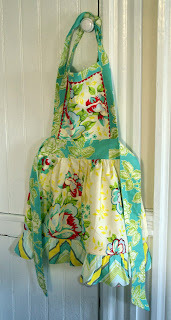 I just love the whimsical, vintage color scheme and the girlishness of the apron. That's what little girlhood looks like to me! Those are gorgeous! Lovely fabric combinations! I love that color combination! Its adorable and actually brings up a whole lot of wonderful emotions. Therefore, its qualifies as art and it is a masterpiece!. Great job! That is so gorgeous! That is beautiful! 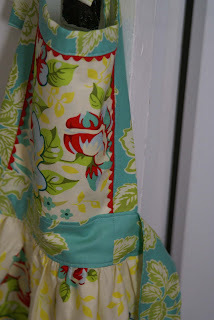 I love the ric rac detail :) You can never go wrong with Heather Bailey fabric. oh man. this is so cute! im going to put a picture of it on my blog with a link to your store. Way cute! Love the fabrics. oh sew cute!! did you use a pattern at all to make it? My favorite project of yours ever! I love the fabric! Your recipient will love this apron! That is one stunning apron. I love it. I need to add an apron to my list of things to do. I keep hoping I am going to find a vintage one in an op shop but it never happens.